Microsoft Windows 8 OS market share growth trails Windows 7 in November 2013. A year after its release, Microsoft’s new operating system is still flummoxing users. “You’ll Hate Windows 8,” my former colleague Farhad Manjoo predicted last June. He was right. And this isn’t just a matter of a difficult transition period, in which people initially resist a new interface before ultimately embracing it, as Microsoft’s Steve Sinofsky predicted. 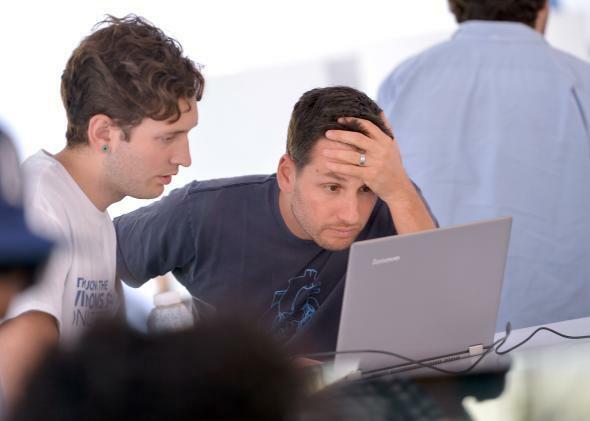 A year after it was released, Microsoft’s new operating system is a certifiable flop. Just how bad are the numbers? There are two obviously relevant points of comparison for Windows 8’s adoption figures, and they’re both so bad that it’s very difficult to say which is worse. The first comes from Statista, the Germany-based online statistics portal, which compared the growth in market share for Windows 8 in its first year to that of its predecessor, Windows 7, in the year after its release in October 2009. Windows 7, which won stellar reviews, took off on a steady upward trajectory, eclipsing 10 percent market share in its first few months and nearing 20 percent at the one-year mark. Windows 8 started slow, continued to be slow, ticked upward a bit this past summer, and—alarmingly—appears to have leveled off again in recent months. It took more than half a year to hit 5 percent adoption, and has still not achieved 10 percent after a full year on the market. Perhaps the most damning statistic, however, was the one The Next Web picked out from Net Application’s latest report on operating-system market share. In the past month, Windows 8’s market-share growth of 0.05 percent was actually significantly lower than that of Windows 7 (0.22 percent). 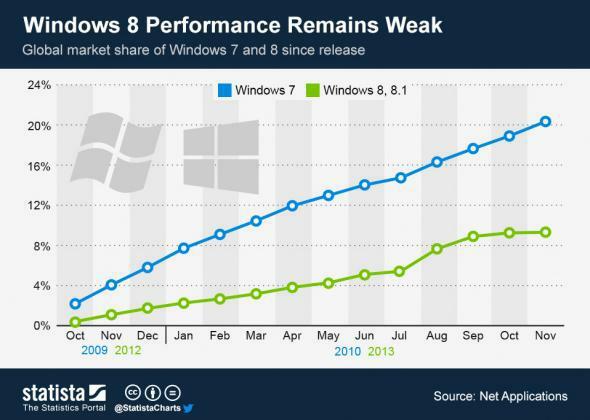 In other words, Windows 8 is actually falling farther behind its own four-year-old predecessor even today. These estimates aren’t necessarily definitive, and Microsoft is no doubt holding out hope that holiday sales of new devices will drive Windows 8 installations back upward. But as of today, it looks like Microsoft users have seen the future, and they’ve decided it doesn’t work.